“Access to a major party’s presidential campaign events shouldn’t be a favor to be granted or withheld,” Politico editor Susan Glasser said. “It is important to remember that this was an absurd policy to begin with and a dangerous precedent for any campaign to have set,” Huffington Post senior politics editor Sam Stein said. 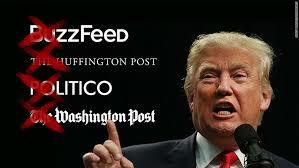 Others denied press credentials include The Des Moines Register, The Daily Beast, BuzzFeed and Politico. Trump has said he would “open up” libel laws, mocked of a disabled reporter, and left a target on specific members of his press corps. At one point, the Secret Service had to get involved with a reporter, for fear of her safety. This week, the Clinton campaign granted campaign plane access to a select group of reporters. Clinton also answered impromptu questions from the press in the air and on the tarmac. Both Clinton and Trump have been criticized by the media for the ways in which they are hindering press coverage. Last month, Carol Lee, president of the White House Correspondents’ Association, argued that both Trump and Clinton are a threat to press freedom.